Tinder Loops are videos people can swipe left or swipe right on. If a picture is worth a thousand words, how about a video? The dating service Tinder now lets you upload a very short video along with pictures. The idea is these Tinder Loops will better reflect your personality. Sorry Android, tut this feature is only available for iOS devices. “You get two seconds of looping video to show more personality, which is the best way to get more right swipes. You can be flirty, you can be fun, but no matter what, be you. And be quick about it,” Tinder said about this new feature. Videos must be recorded outside of the Tinder app, then imported. It’s not necessary to record just a quick clip. Once inside, you choose which two seconds of the video to use. As their names suggest, the videos loop. But be aware, they play both backward and forward, so pick an action that looks good running both directions. And it’s not necessary to kick out a still image to add a moving one. Profiles can now include nine images instead of six. 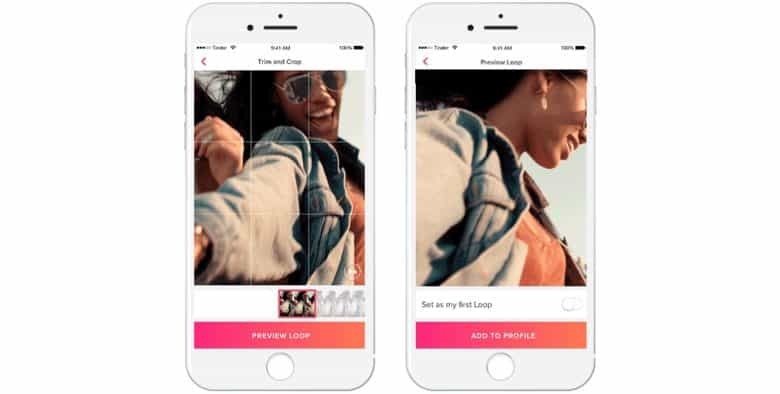 Tinder Loops just launched today in US, UK, France, Germany, Spain and other countries. It’s free to anyone using an iPhone or iPad in one of these areas. This isn’t the only improvement this app is undergoing. Testing is going on for Tinder Picks, a service that tries to connect users with people who have similar jobs, educations, and interests. Unlike Tinder Loops, this requires an additional fee.